Palki Grid Blogger Template is a newer version of Palki blogger theme. It will comes in grid style for any kind of review website. 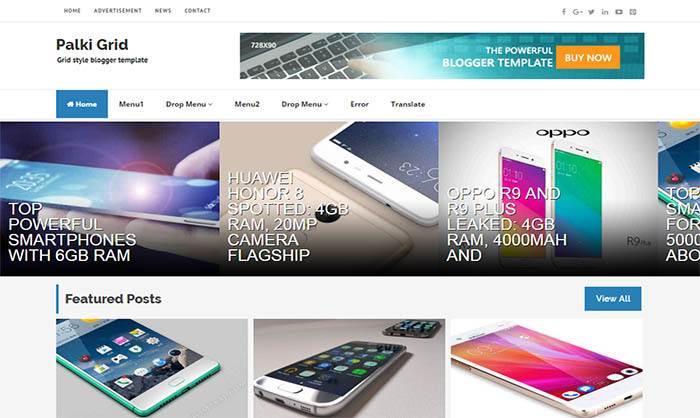 If you running a smartphone review website, then Palki grid template will be perfect for your blog. This is a minimalist design and search engine optimized. Also responsive and compatible with all smart phone devices. In this template we’ve used Carousel recent post widget and Featured post widget with specific label. Mobile friendly theme is essential for better search results so by using this them on your blog you can easily boost search engine ranking of your blog posts.